ONLINE TICKETING HAS ENDED FOR THIS CONCERT. ARRIVE EARLY AND BUY A TICKET AT THE DOOR. 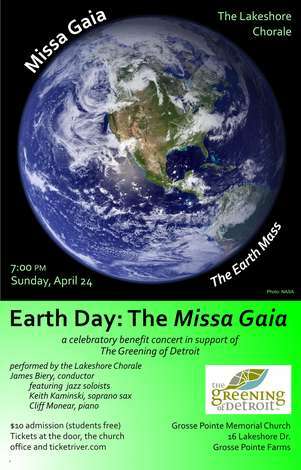 Music at Memorial’s spring concert celebrates Mother Earth with the Missa Gaia, or Earth Mass, which was written in the early 1980s by the Paul Winter Consort with organist Paul Halley. It was created to be performed in the Cathedral of St. John the Divine in New York City. An environmental liturgy of contemporary music, it uses the traditional forms of the Mass in movements like the Kyrie and the Sanctus, but also features the calls of wolves and loons, whale-songs and jazz instrumentation. The concert features some of Detroit's finest jazz musicians, including Keith Kaminski on soprano sax, Cliff Monear on piano, and Jeff Pedraz on bass. Vocal soloists are Sheena Law and Diane Schoff. The Lakeshore Chorale also sings the beautiful “Alleluia” by Randall Thompson and music by John Rutter and Calvin Hampton. You won’t want to miss this joyous evening of music!